Tom Grello and William Lilly met more than 20 years ago when they worked together at a local HVAC company. “I had a dream,” says Grello, “of starting my own business. Bill and I had often said, ‘We ought to be doing this ourselves.’” On December 2, 1988 they made that dream a reality when they started Tru-Comfort working out of Grello’s living room. Since then, Tru-Comfort—specializing in heating, air conditioning and indoor air quality–has become well known throughout the Lehigh Valley. 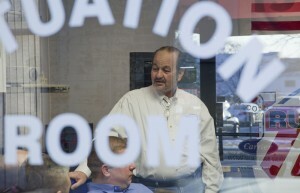 Over the years, they have moved twice into larger quarters and employed as many as 30 people. Their core business is designing, installing and servicing heating, air conditioning and indoor air quality products for both residential and light industrial. Their installation experts are trained to install heat pumps, central air conditioning, oil and gas systems, hot water tanks as well as humidifiers, dehumidifiers, water softeners, electrostatic and electronic air filters. Tru-Comfort is a Carrier dealer, but they install other equipment brands and service all brands of heating and cooling equipment. 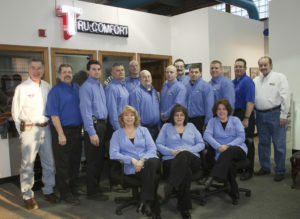 The partners have made service Tru-Comfort’s highest priority. They promise 24-7 response, including night staffing, so that a call for emergency service is returned within 15 minutes. “Our aim is to develop a relationship for life with our customers,” Grello explains, from working with them to design the best system for their homes to making sure the systems they have are working at top efficiency and reliability, year-round. Their service philosophy also includes recruiting, training and retaining good employees. Grello says, “We’re proud of all of them and have worked hard to keep them employed despite bad economic times.” Every Wednesday morning, they hold an open forum company meeting encouraging everyone to express their ideas on how to improve operations and service. Technicians are continuously being trained to keep up with the latest industry technology as well. Achieving indoor comfort and air quality can go hand-in-hand with saving energy, Grello states. To that end, Tru-Comfort initiated a “Going Green” program that includes products that are energy efficient, environmentally friendly and cost effective. These include central heat pump systems with a SEER (seasonal energy efficiency ratio) rating of 19.0, exceeding the government’s mandated minimum of 13.0; natural and L.P. gas warm air furnaces that achieve up to 96 percent efficiency; geothermal heat pump systems; solar powered hot water systems; hybrid heating systems that use heat pumps with fossil fuel warm air furnaces and many other products that can save both energy and dollars. Also, annual maintenance and cleaning keeps systems running at peak performance, while duct cleaning and sanitizing ensure maximum capacity and indoor air quality. “We’ve taken our green initiative a step further,” Grello says, “by going green internally.” They routinely recycle cardboard, scrap metal, glass and aluminum and have a paperless office system. Their service vehicles are averaging 28 to 29 mpg. Another important “green” element is recovering and recycling refrigerants and refrigerant oils according to the Montreal Protocol and EPA standards. And, when they needed larger quarters, they remodeled an old warehouse rather than building new. The partners have worked hard to brand their company…taking a lesson from the marketing philosophies of Max Hess of the defunct Hess’s department stores. “I asked why their trucks had only the name Hess’s on a white background,” Grello remembers. The reasoning was to create an image. He and Lilly used that principle in designing their fleet…white trucks with plain, block-lettered signs…all adding up to a distinct brand that evokes service and comfort. Nancy Moffett has a passion for–and many years’ experience in–writing about home-related topics. Her work has appeared in New Homes and Remodeling, Dreams and Residential magazines as well as in Lehigh Valley Marketplace.